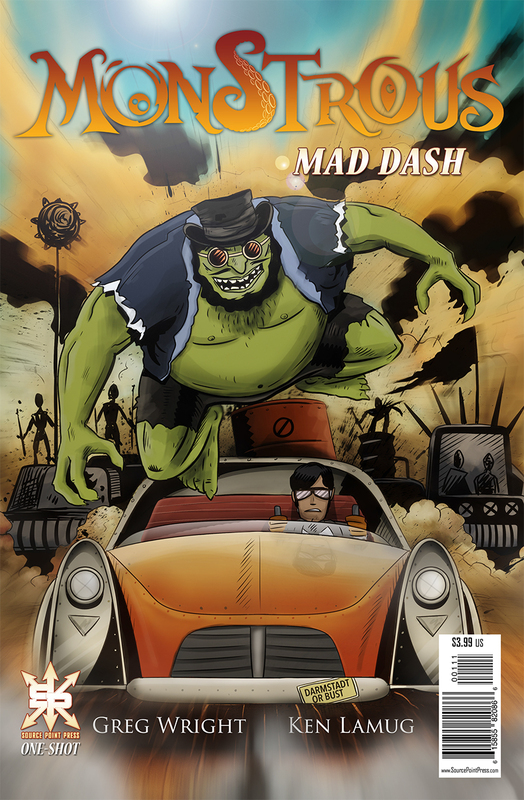 The fan-favorite title MONSTROUS is BACK with this exciting one-shot, MAD DASH! Don’t miss out on this adventure as Doctor Frankenstein and Dr. Jekyll take a daring trip to rescue Jekyll’s daughter. Who will try to stand in their way? And are they powerful enough to withstand the horror of MR. HYDE? Dr. Victor Frankenstein created monsters, and did such a good job of it that they quickly grew beyond his control. Then he made robots, mechanical enforcers built to control the monsters. Predictably, at least to anyone but Dr. Frankenstein, the robots became self-aware and left their creator behind. Now, in a bid to secure their society, the robots have kidnapped the daughter of Dr. Jekyll. Their hope is that once the ransom is paid it will ensure their continued existence and growth. To rescue her, Jekyll and Frankenstein will have to travel to the robot’s stronghold in Australia, and face the mechanical forces standing in their way. The world of Monstrous is always an interesting and entertaining dip into the strange. Equal parts tongue in cheek humor and steampunk adventure, it’s a tough title to pin down into any category or genre. Using elements of classic gothic horror stories, Greg Wright has created a bizarre world full of even more bizarre characters and concepts and every time he sends me something for review, I have to wonder what else he’s going to shoe horn into his stories. I haven’t been disappointed yet. Mad Dash takes a step in a direction that really should be pretty obvious… The robots have taken Amanda Jekyll to their hideaway, “somewhere in Australia”, and have sent out their forces to intercept the inevitable rescue attempt. Okay, let’s see… the good guys are driving across the Australian Outback, and the robot Warriors have mounted up to meet them on the open Road. They’re Mad, and with all of the Fury they can muster the action is sure to be kicked up to the Max. Look, I don’t think I can come up with any more bad puns (scratch that, I’m pretty sure I could if I had to). If you haven’t figured it out, you’re just gonna have to buy the book and see it for yourself. Greg Wright’s Monstrous world started out with a giant killer bunny as the protagonist, and got stranger from there. The latest one-shot story teams Dr. Frankenstein up with Dr. Jekyll/Mr. Hyde, in sort of a Lethal Weapon buddy caper, and it looks to me like Wright had a great time putting it all together. I kinda like the format he’s going with, running Monstrous with a series of single issue stories that let him stretch out and touch on multiple elements you might not expect to see brought together. Taken as a whole, the series is building a pretty interesting and entertaining world. Crafting the visual style of that world is Ken Lamug, with artwork that’s somewhat stylized and a little reminiscent of Mike Mignola’s work. While it might look a little rough at first, it’s a style that works very well with the eclectic collection of elements brought together for Monstrous. In particular, Lamug puts a lot of effort into character designs, providing plenty to look at and seeming to do his level best to refrain from drawing the same thing twice. The robots in Mad Dash are as varied as a group of mechanical rebels could possibly be. Monstrous as a series is a great bit of escapism… there aren’t any huge timelines or crisscrossing story arcs to keep track of, and you can jump right on in any time without worrying about catching up. It also has the benefit of being absolutely unlike anything else out there that I’ve seen so far, and that’s gotta count for something. If you’re looking for something a little different, I think it’s safe to say that this fits that bill pretty well. You captured the story. Thanks.